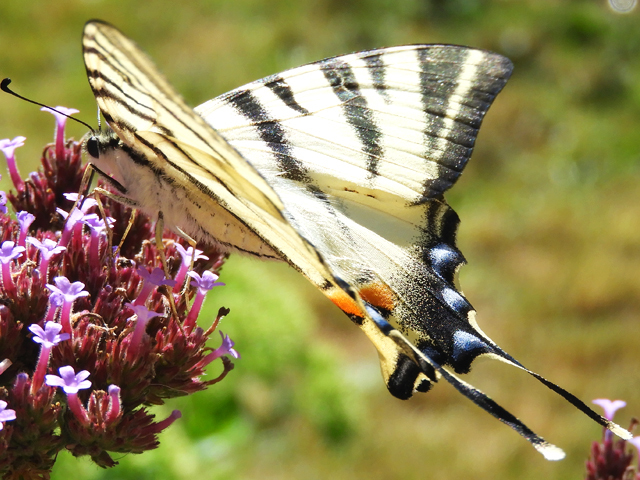 The beautiful Jersey Tiger moth is common throughout France and flies both during the daytime, when they can be seen feeding on the nectar of their favourite flowers Buddleia and thistles, and at night. Its distinctive markings make the Jersey Tiger moth both unmistakable and striking; cream stripes on dark brown wings, with red markings underneath. The adult wingspan is between 52-65mm. 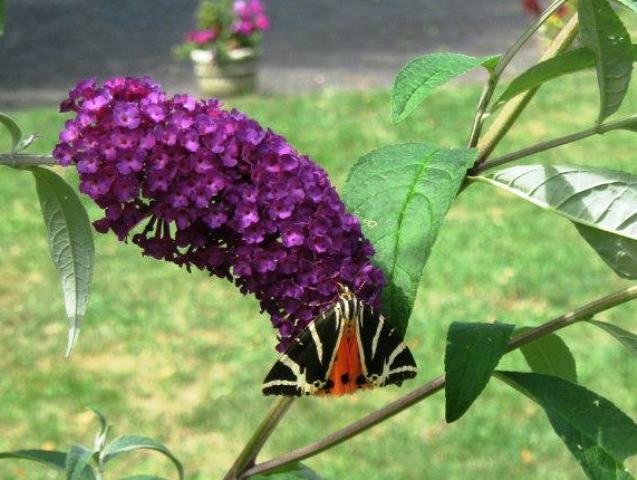 Jersey Tiger moths fly between July and September so keep an eye out for a flash of red! This photograph was taken by Christine Phillips (twitter @hazmattmum, www.hirondelles-chabanol.fr), département 63 Puy-de-Dôme. Thanks for the great photograph Christine. You are welcome. Lots of Jersey Tigers here in the Auvergne. 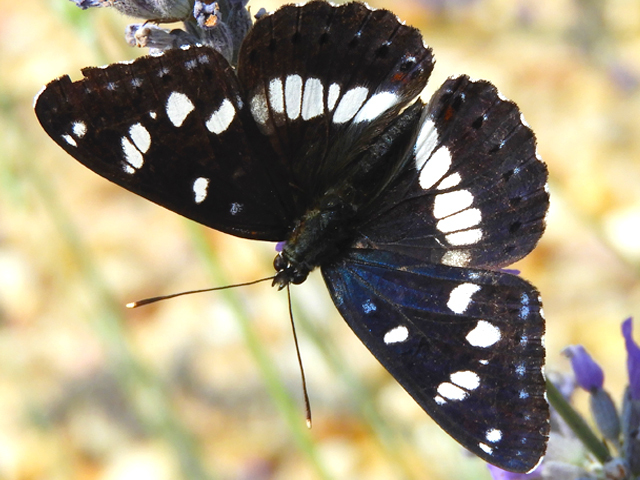 They are really striking especially when teir wings are folded as all you see is the cream & black markings..then they fly & the red is visible. Just seen my first Jersey Tiger Moth in back garden Herne Hill, South London.Wings closed and resting so it looked like some amazing African mask against the dark green of the large ivy leaves. WoW! Saw a Jersey Tiger moth yesterday in my garden. Spectacular specimen, specially when it took flight. 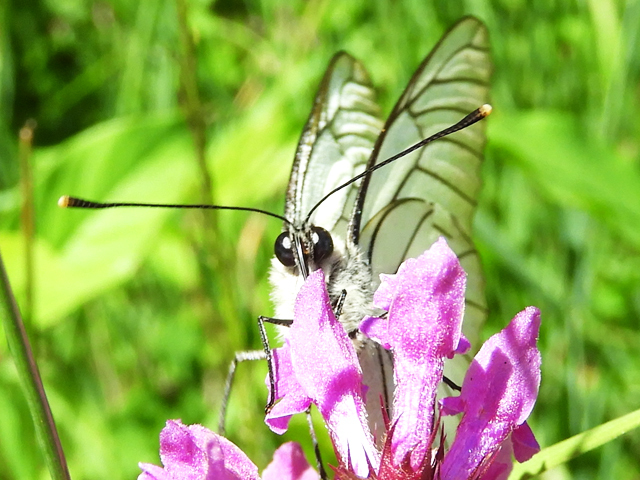 So glad to have identified this beautiful moth. I saw several last week in Brittany. My description was also ‘like an African mask’ with this striking orange revealed when in flight.